Can Internet relationships work? This is the big question for everyone involved in online dating. While there are some disadvantages to Internet relationships, there are some good things as well. Internet relationships can work if the couple is committed to making it work. An internet relationship is nearly identical to a long-distance relationship, and there are many couples who are proof that love can overcome the distance. If you think you have found a great person online, the hardships of having an internet relationship may be worth it. It's estimated that a third of all marriages in the United States result from relationships started online. Couples who meet online tend to get married faster than couples who meet offline. eHarmony makes the claim that 20% of committed relationships began online. Psychology Today estimates that by the year 2040, 70% of couples will meet online. A study by Stanford University asserts that couples who meet online are no more likely to break up than couples that meet offline. Online relationships are no longer unusual. Considering the above statistics, it appears that online relationships should be considered "real" and can truly lead to committed relationships. In fact, The Atlantic says there is little to no distinction between online and offline relationships. You'll have to decide for yourself, but there are lots of ways you can make it work. Is it possible to fall in love with someone over the internet? It would appear that in some cases, the answer is yes. It's more likely when both people in the relationship portray themselves in an honest way. When an online dater pretends to be someone they aren't, any feelings of love aren't necessarily valid. On the other hand, some experts suggest that falling in love online isn't genuine because too many variables are missing in conversation (such as nonverbal communication) when it isn't face to face. It's safe to make the assumption that the answer has to be "maybe," depending on individual circumstances. There are a few things that couples can do to help their internet relationships succeed. All relationships need communication in order to last. This is especially true for Internet relationships. In fact, communication is all that some internet couples have, since they are unable to spend time together in-person like traditional couples. The great thing about this, however, is that the couple will quickly determine if they enjoy talking together. On a normal date, you may be blind to the lack of intellectual and emotional compatibility if you are physically attracted to your partner. When all you can do with each other is talk, you'll know for certain if the two of you share a connection. This creates a communication and emotional base to the relationship that can be lacking from traditional relationships. If the two of you transition from internet to in-person couple, you'll have the potential to be a very emotionally connected couple. Since internet couples often start communicating by e-mail and instant messages, there is a tendency to continue relying on these communication methods. Writing to each other has its place, but you'll enjoy the relationship more if you use the phone as well. Hearing each other's voice just can't be replaced by typing emoticons. To avoid long distance phone bills or to save your wireless minutes, consider using internet voice technologies. Services such as Vonage or Skype allow you to talk over the Internet using your high-speed connection. You can talk for hours without having to worry about the bill. While the phone is an improvement over e-mail and instant messaging, nothing can match spending time together in person. If you haven't met each other yet, begin making plans to do so. Some couples don't consider their relationship official until they verify in-person chemistry. Chances are the chemistry you have on the internet and over the phone will continue when you meet, but you can't be absolutely sure until you are standing next to each other. After you meet for the first time, begin making plans for a second visit, if the first meeting went well. The time between visits can be hard to endure, especially if you are in love. However, having an upcoming date on the calendar will give you something tangible to hold onto and look forward to in-between visits. Everyone you date deserves your honesty, but internet relationships are overly dependent upon honesty. An internet relationship is not for everyone. If you find that you can't endure the separation or are tired of being limited to phone and e-mail conversations, be honest about it. There is no sense continuing any relationship if your heart is not in it. Along with honesty is the need for trust. Since you are not physically near each other in an Internet relationship, it can be difficult to know exactly what the other person is doing with his or her spare time. This easily allows suspicion to enter the relationship. If you can't trust that your internet partner isn't also dating someone else, then your internet relationship is doomed to fail. 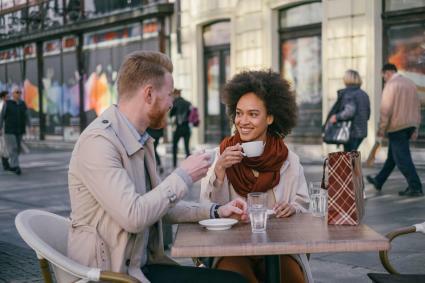 Assuming the goal of your internet relationship is to eventually have a traditional, in-person relationship, then at some point you'll need to discuss how to make this happen. When to talk about this is a sensitive matter. If you talk about it too soon, you may scare off the other person. If you wait too long, your date may become anxious and want to end the relationship. For every couple the timing is different, but at some point, you need to discuss how, and possibly, when, the two of you can finally be together. Can internet relationships work? Of course they can. For a couple that is interested in each other and wants to see where the relationship goes, the internet should be seen as a means of communication instead of the definition of their relationship.